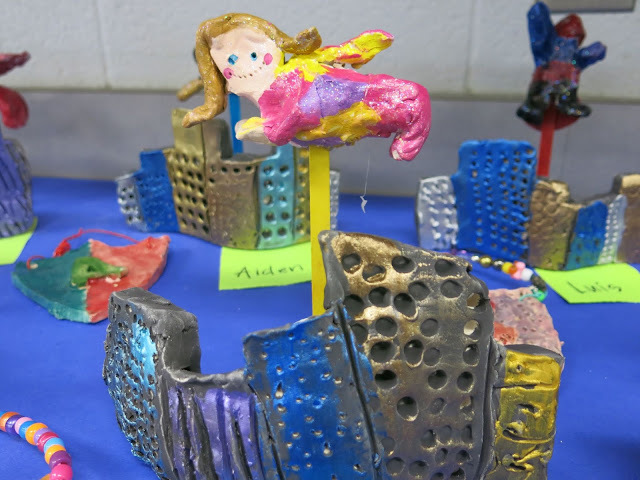 Here is the final installment of the 3D tour of our art show. Our school-wide art show features every work of art created by every student. 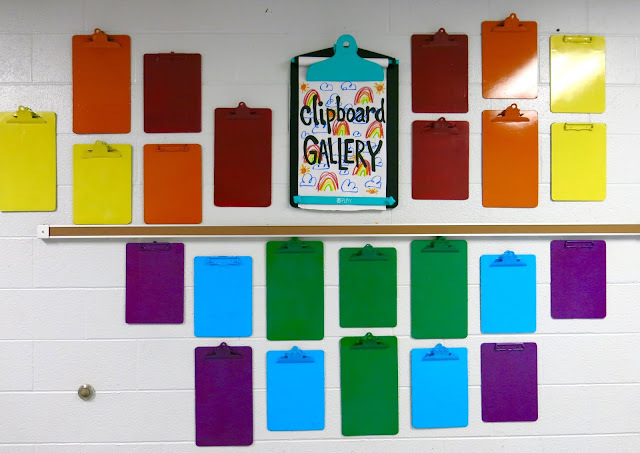 The halls are filled with your 2D pieces (future blog posts on those displays!) while the art room showcases our 3D creations. 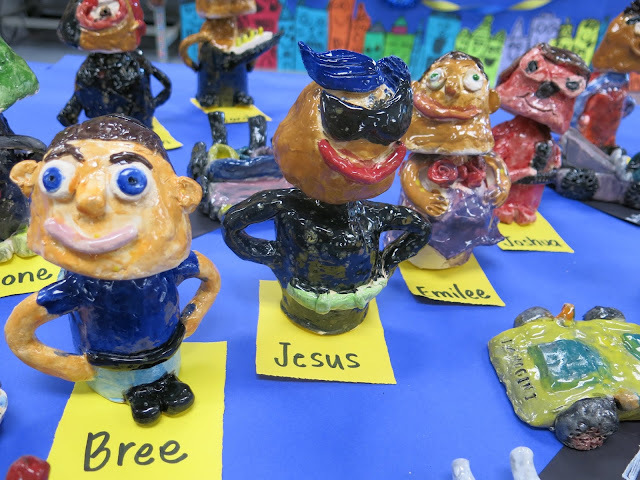 You can see Part 1 and Part 2 of our art show tour of 3D works. 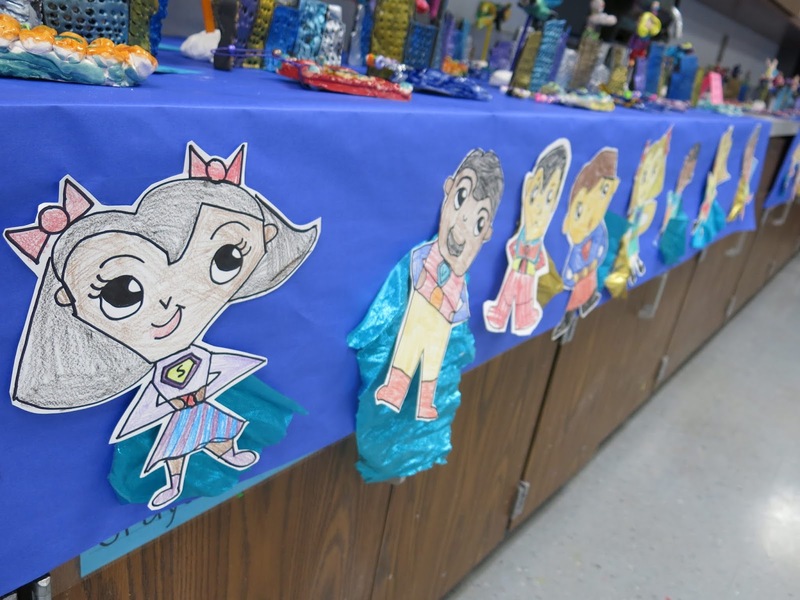 Our art show was Superhero themed (tho you'd never know it by this display) and the kiddos were asked to dress the part. You can read more about that here. 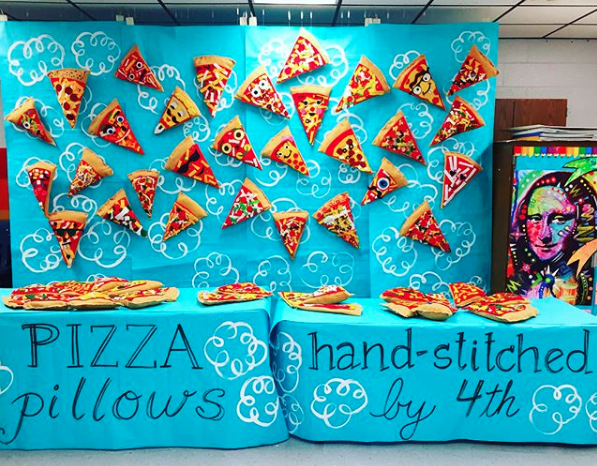 My fourth graders stitched up these massive Pizza Pillows this spring and I knew I wanted a fun display for them. 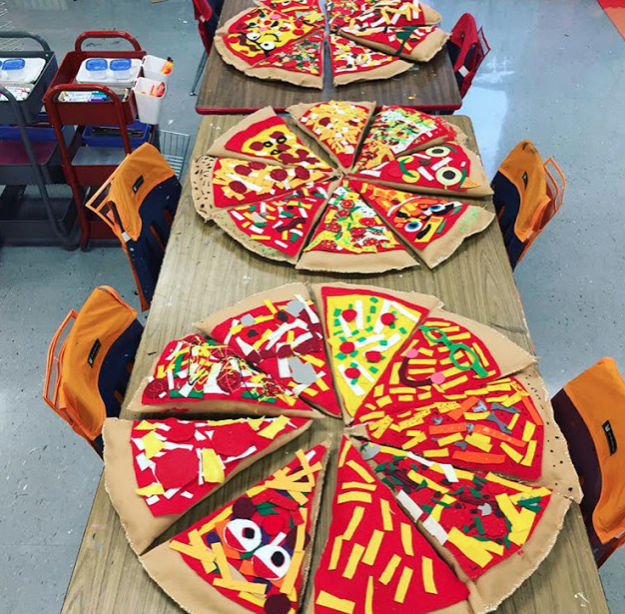 I had thought about creating oversized pizza boxes to put them in like we did with these clay pizzas created a couple years ago. While they look cool, they only are impactful if you are standing right over them. So I got this idea to create a Pie in the Sky display! 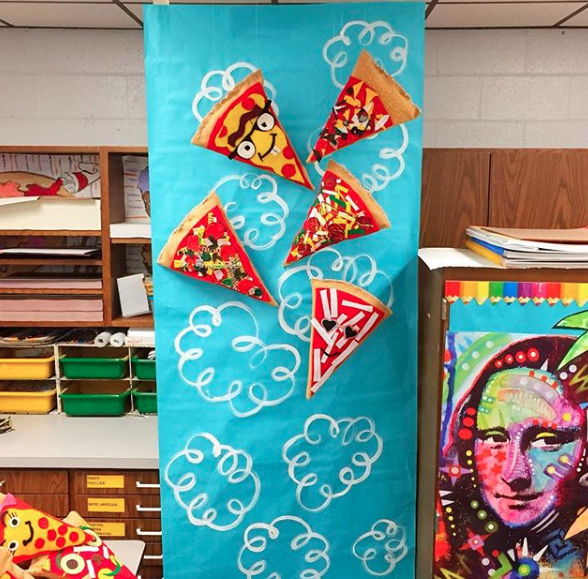 I started by painting and hanging one paper panel and pizzas in front of it, just to see how it looked. I immediately loved it and decided to make the whole display this way. If you are interested in more details about this project, here's the video I created last summer. In this video, I am creating a variety of pizza plushies. However, for my kiddos, we went bigger. That's really the only difference. Complete lesson here and here. Here's a terrible picture of how I hung the paper. I put a strip of masking tape across the back. Then I created a tab of masking tape by folding a piece of tape in half. From there I used two paperclips linked together. 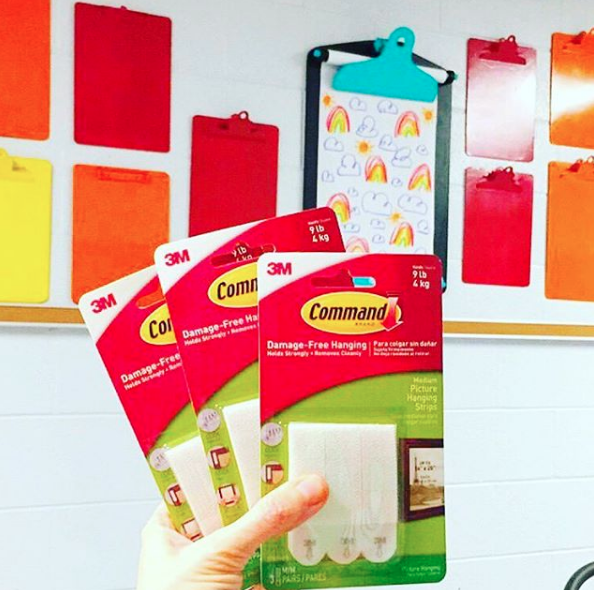 One went thru the tape tab and the other was stabbed into the ceiling tile. 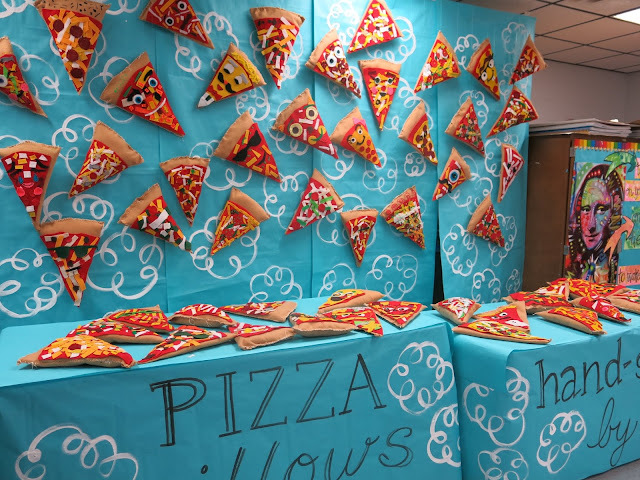 To hang the pizzas, I simply used fishing line. 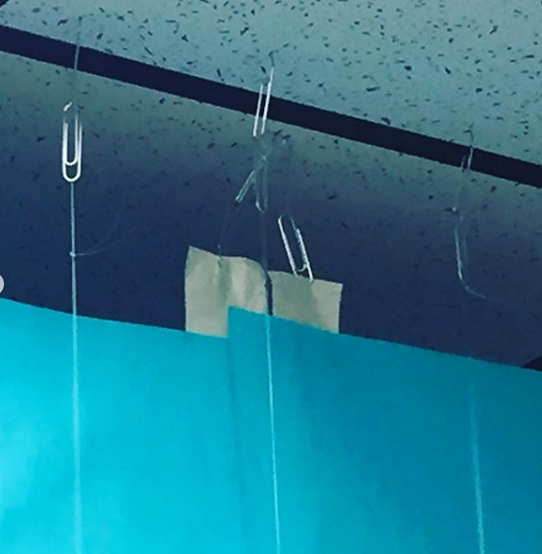 I fed the line thru the pizza and hung it also with linked paperclips. 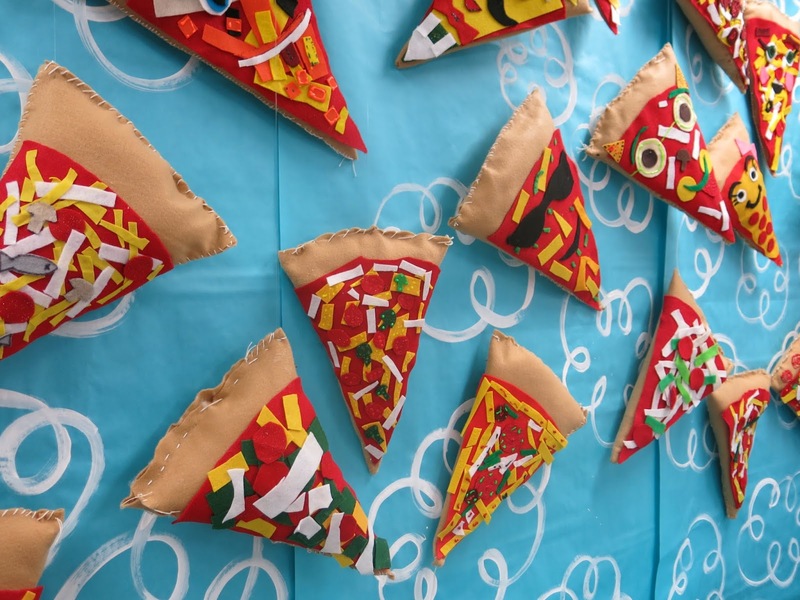 To prevent the pizzas from twirling in the wind, I made sure they butted up against the paper so they would not rotate. 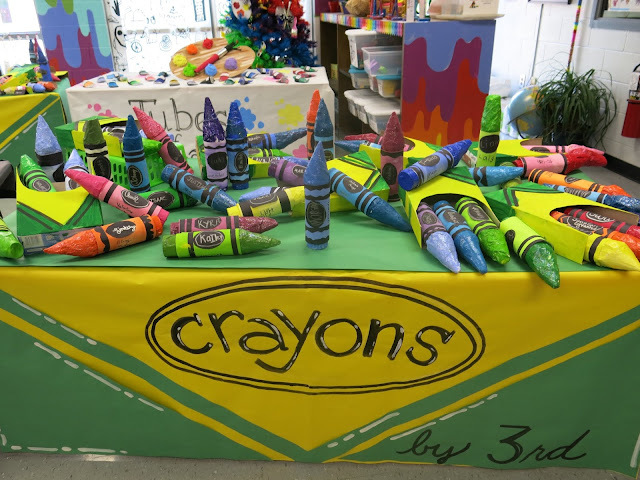 This was definitely a show stopper...and the younger kids were all asking "when are we making THOSE?!" That's when you you know you got a winner! Hi, friends! A couple of days ago, I shared with y'all Part 1 of the 3D displays at our school-wide art show...today I thought I'd share Part 2! The theme of our art show was Superheroes and so every project created by my 1st through 4th grade kiddos was superhero inspired, including the backdrop! 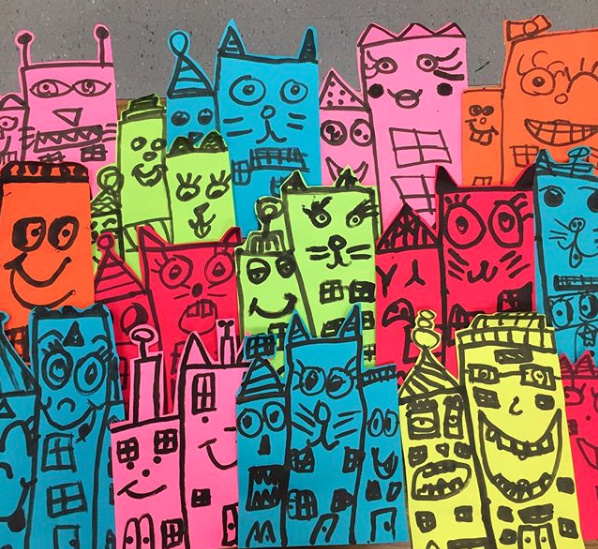 While I was attending NAEA, I created a sub plan for my kiddos introducing the artist James Rizzi. When it came time to create a backdrop for our superhero city, I reminded my students of this artist. 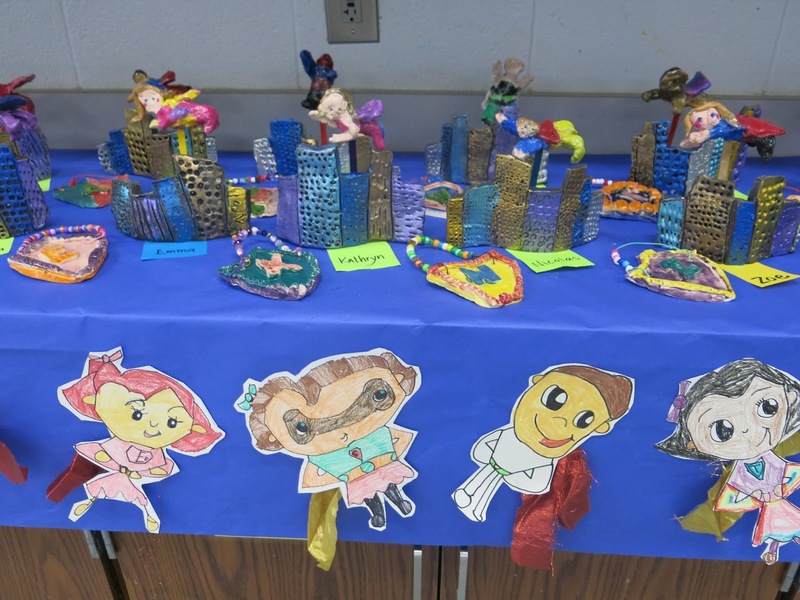 Using bingo daubers filled with diluted India ink and construction paper, they created these fun cities. 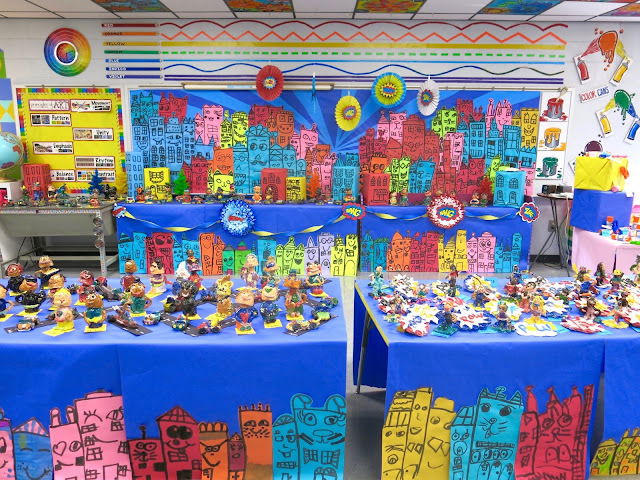 They made the most epic backdrop for all of our superhero projects. Here's a time lapse of our big night! I feel like I've been in go-mode every since returning from the art teacherin' conference in March. 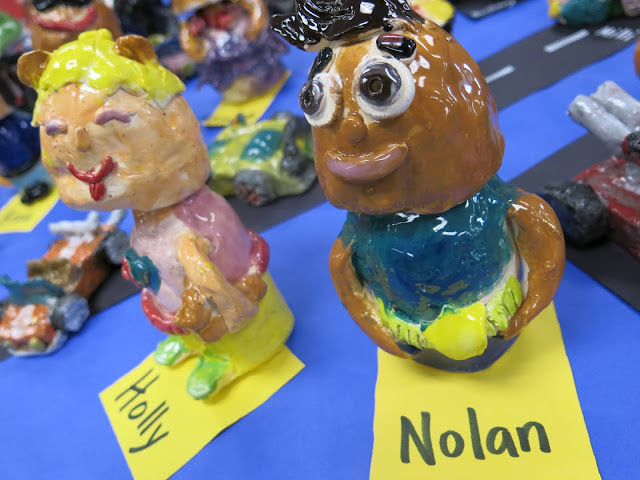 We hit the ground running with clay projects right after spring break. 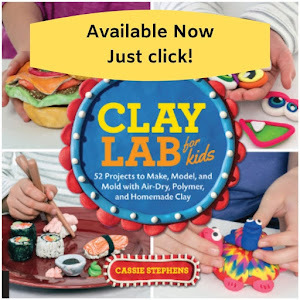 Normally, I create instructional videos for my clay lessons but this time around, I just didn't have the time. So...I'll be sharing the projects with you but just know that more details are to come. 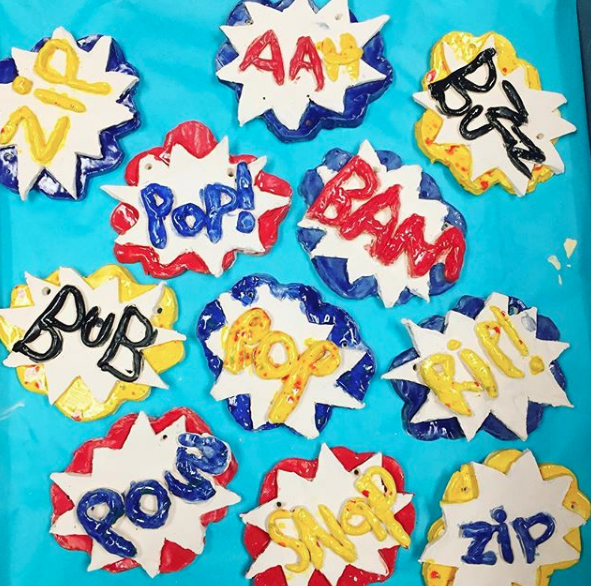 To kick off our superhero theme, my second graders created onomatopoeia plaques. 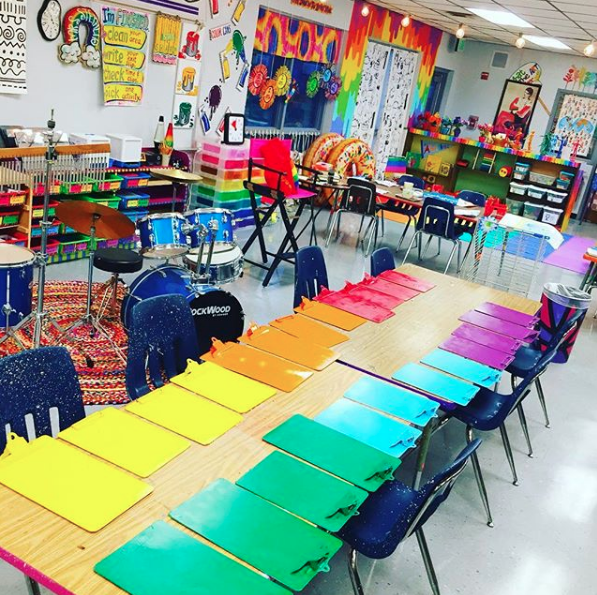 We have 30 minute art classes so on the first day, we created the background piece and painted it with glaze. The following day, we added the middle piece and the lettering. Once out of the kiln, we glazed the lettering and fired again. While waiting for the firing, we created Model Magic beads for the hanger of our plaques. More details on this project to come! My second graders also created these sweet superhero selfie statues! 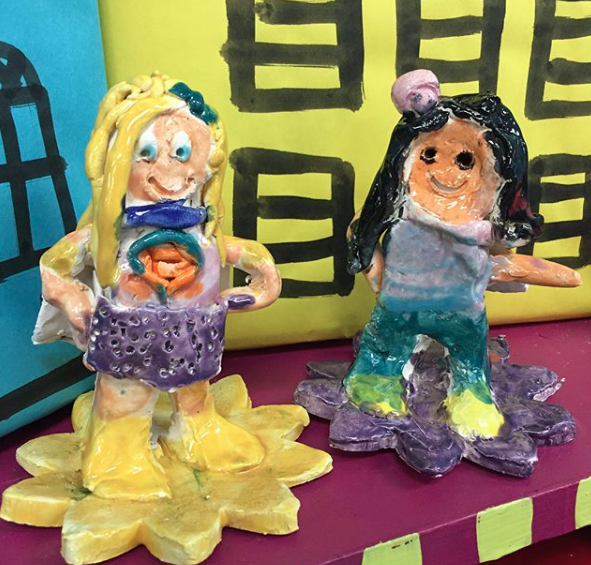 I had two classes come at once so that I could have an hour of art with my second graders. We created these in that amount of time. Complete details (hopefully with video!) to come, promise! 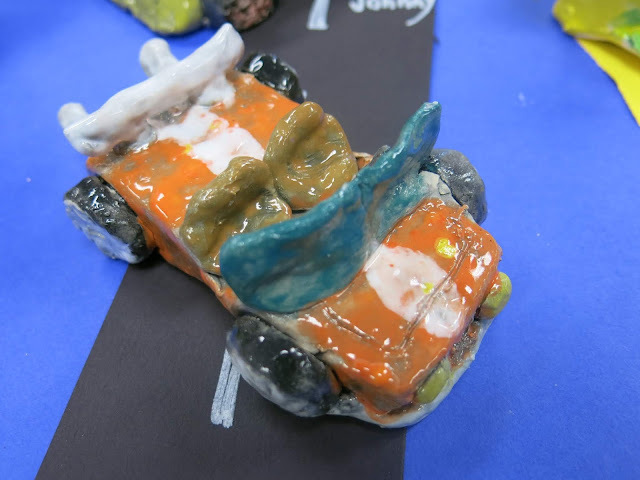 We used cone 06 Amaco clay to create these. 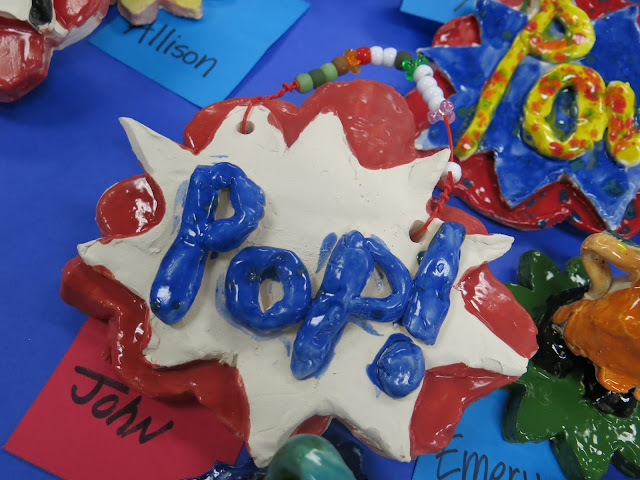 Once out of the kiln, we glazed with Amaco's Teacher's Palette glaze. I only have three rules when glazing: do not glaze the bottom, NO WHITE SPOTS and be sure and glaze everything a minimum of three times. I love that this superhero has a sidekick! Third graders created superhero CARS! 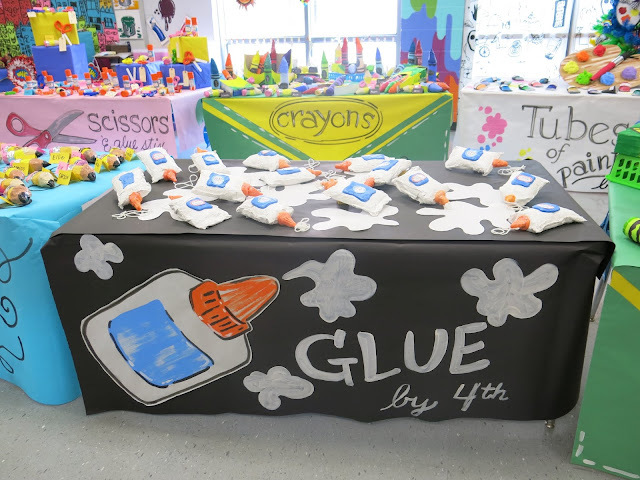 This was easily my favor project to teach and see come together...each one is so different and so fun. 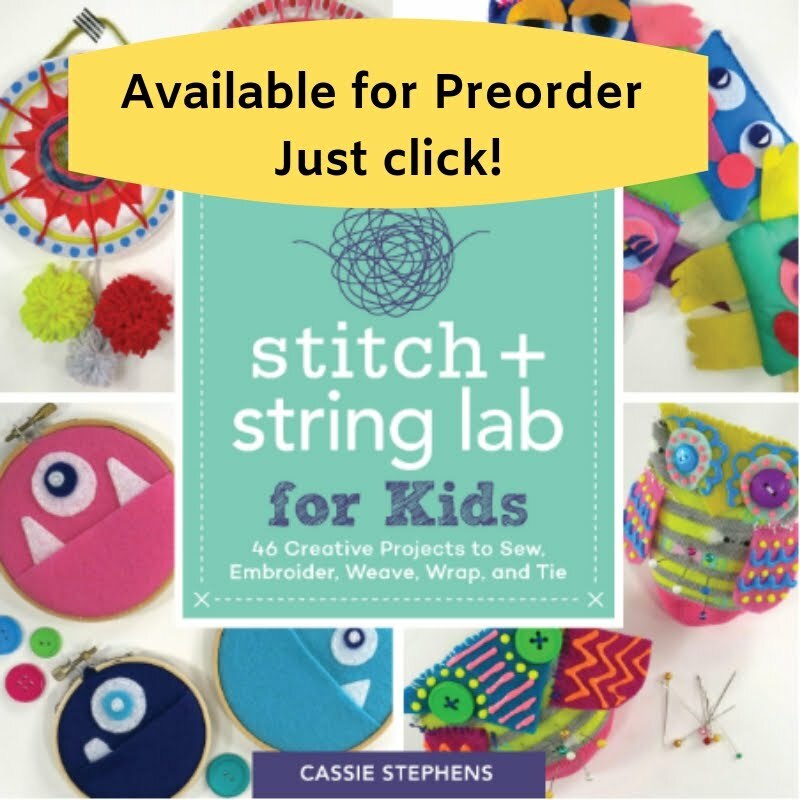 I cannot wait to share with you just how easy this project is. 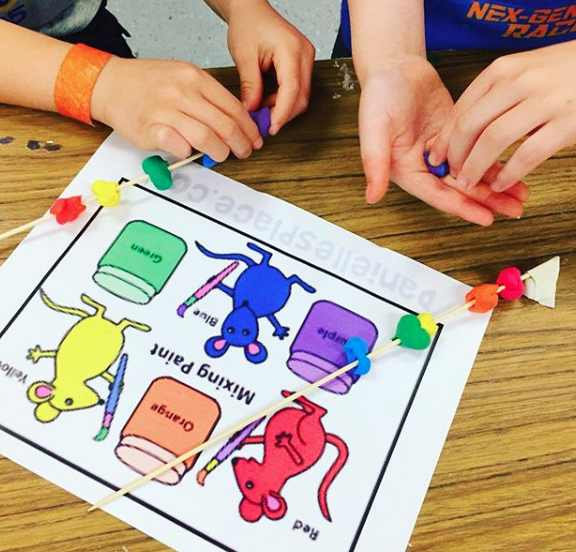 Every kiddo was completely excited and engaged! 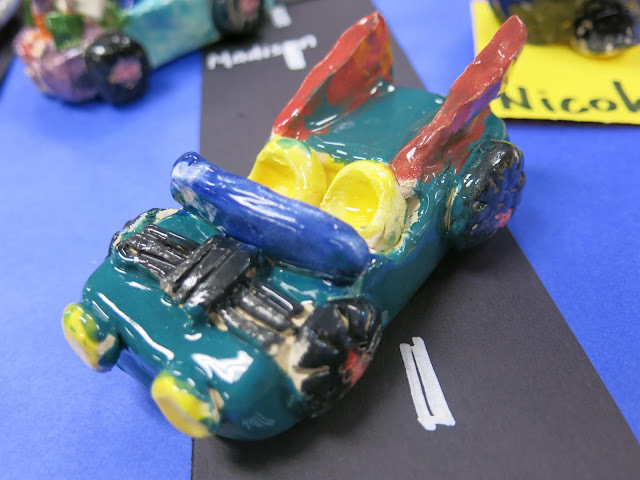 From drag race cars to sports cars, jeeps, limos and more, they came up with everything. 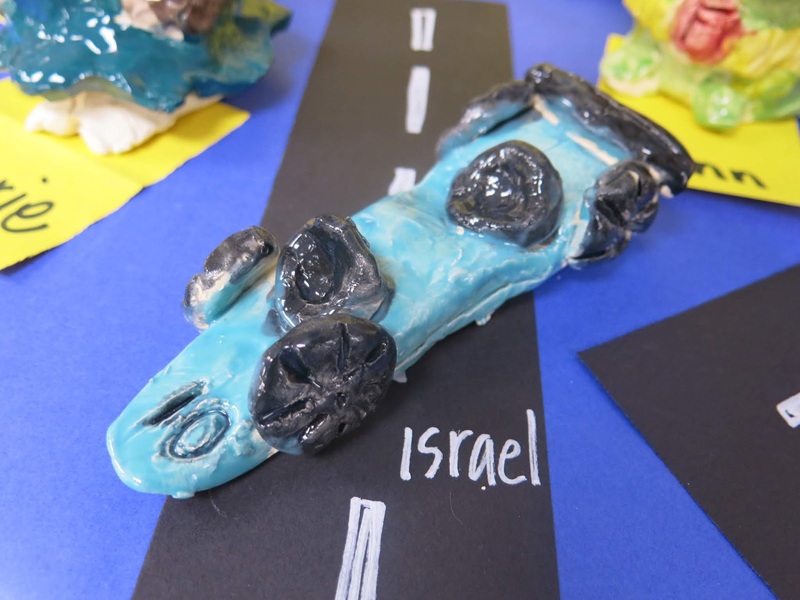 I had originally planned for them to also create a 3D pop up city to display their cars in...but we simply ran out of time. One fun thing we did was add alphabet noodles to the license plates of the cars (or anywhere else the kids wanted). This was a fun way for the kids to personalize their cars. The noodles burn out in the kiln, leaving behind their impression. Don't tell...but this AMAZING drag race car is my absolute favorite thing of all time! The imagination and invention on this kid...such a show stopper! 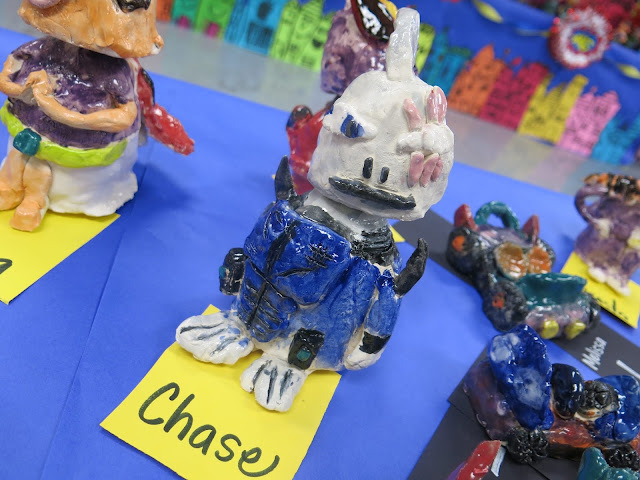 My fourth graders created bobble head superheroes. 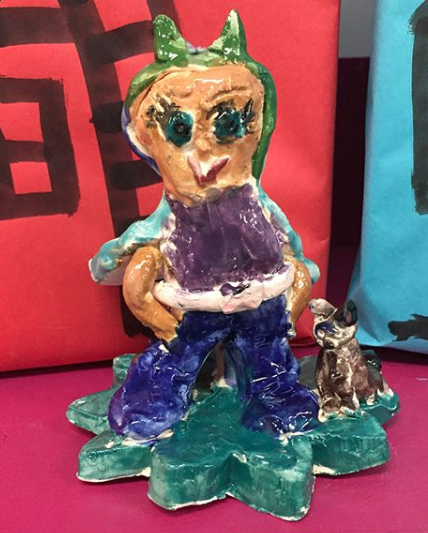 We created bobble head pets last year in fourth grade. This was a variation on that project. And some of did not. And I love both! 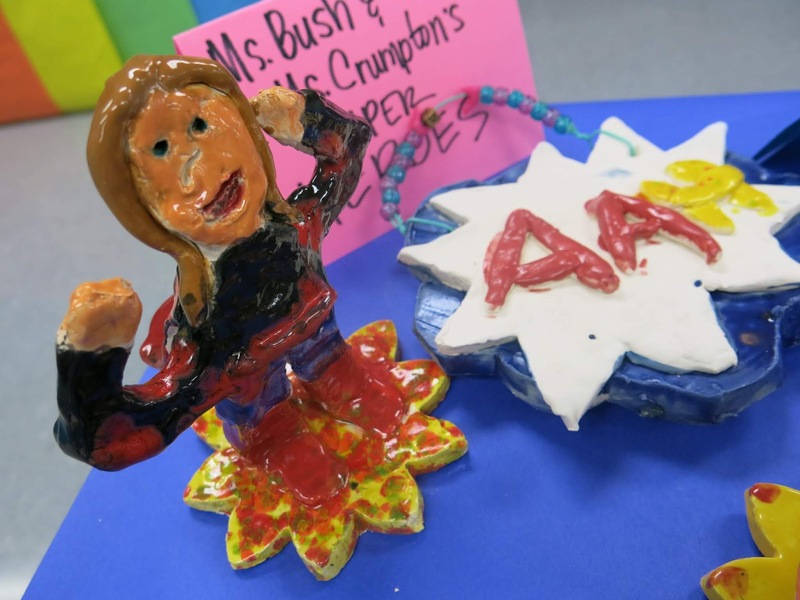 Every year, I love these bobble head projects more and more. 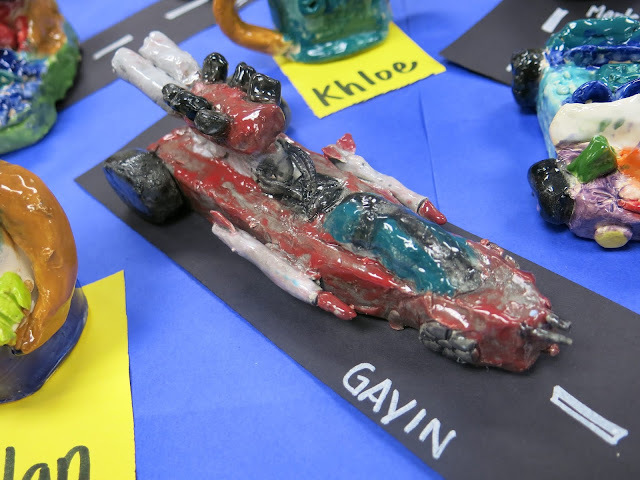 Now don't you go telling anyone, but the first grader's projects just might be my favorite. And they were easily the most excited bunch. 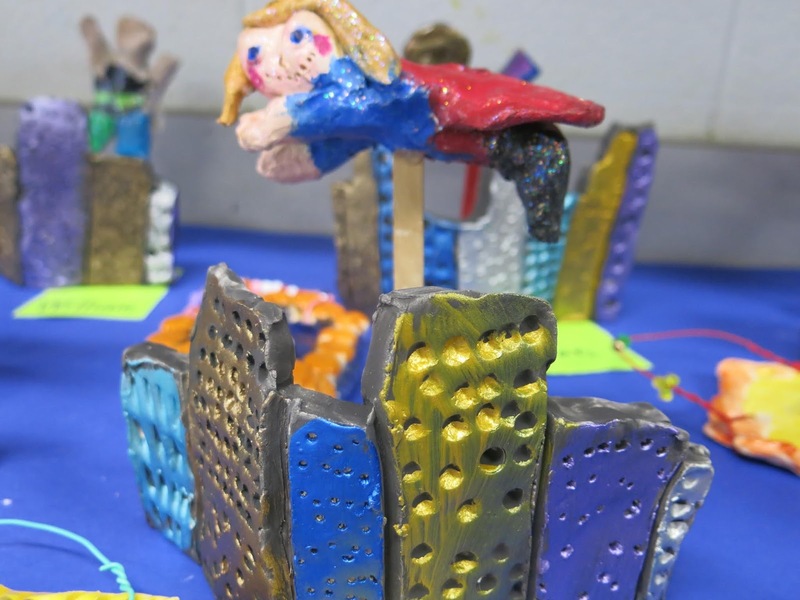 We started by creating super cities in our 30 minute classes. After they were fired, I dunked them in diluted black tempera paint and the kids added metallic paint on top. 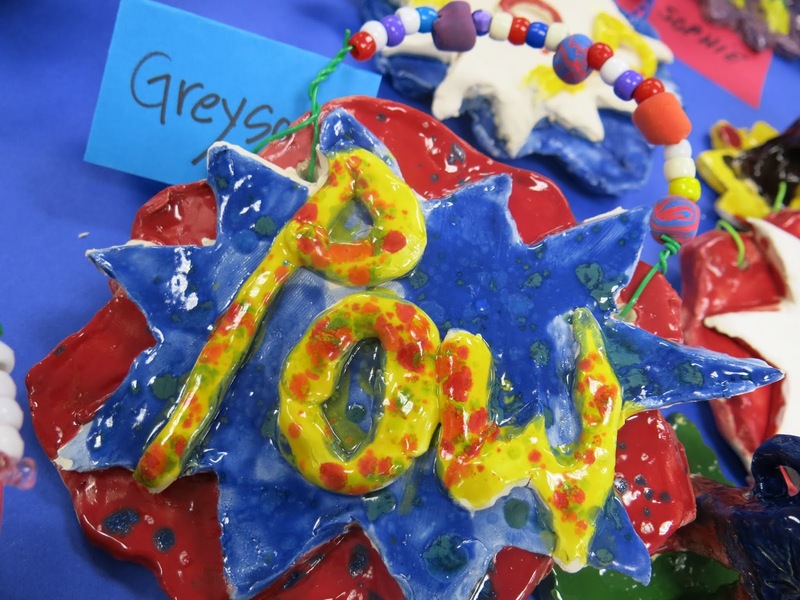 We also used clay to create a flying super selfie! These were painted with tempera cakes and sealed with sparkle Mod Podge. 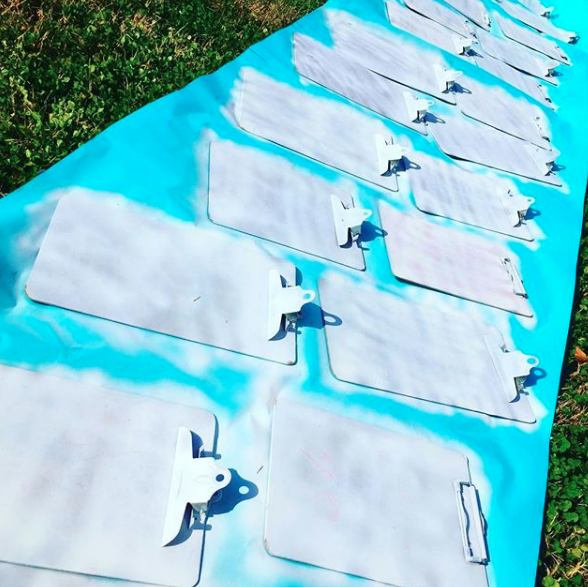 Super shields were also created...I cannot wait to share with y'all the details of those projects. But that will have to wait. Thank you so much for letting me share our Superhero portion of the art show! 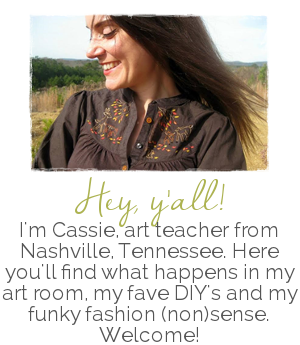 In case you haven't noticed, things have been a lil quiet around this here blog. It's not because I've not been busy...in fact, it's quite the opposite. I've been so busy with art show prepping (and other life stuff) that I found myself unable to keep up with my usual three posts a week. 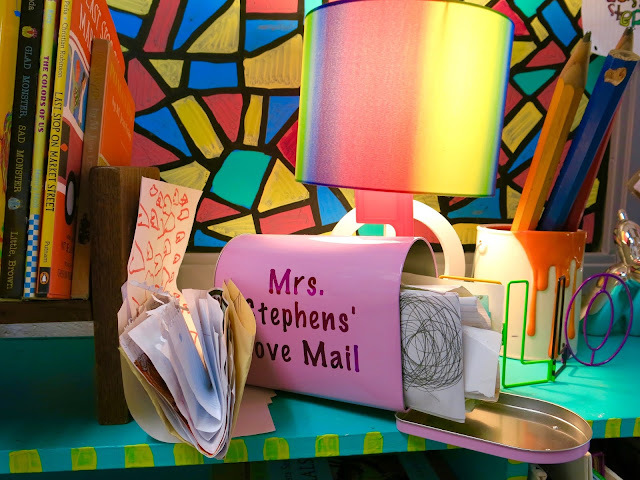 This has NEVER happened before...and I think that's because this was our biggest and most time-consuming art show yet! 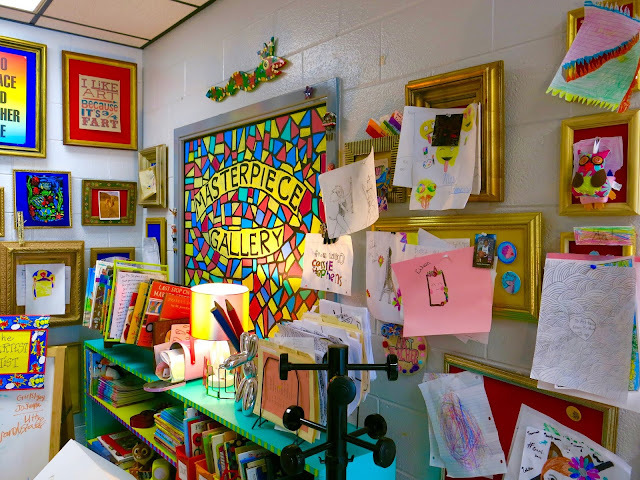 Yes, I know, my art room is very large! It used to be the school library before a remodel that happened well before my time. Why do you think I wanted to be at this school so badly?! 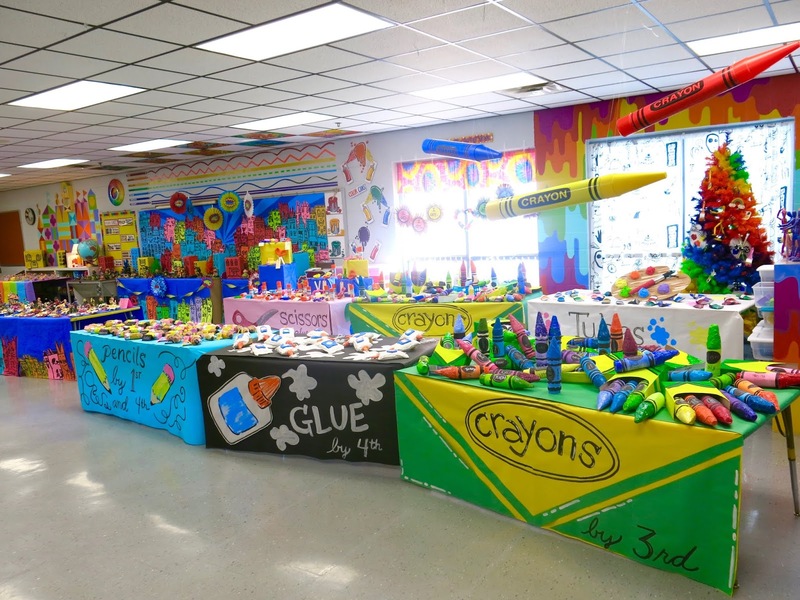 I'm fortunate that my administration gives me the day of the art show "off" to set up my art room like this. My specials team also helped me out by taking some of my classes to allow extra set up time. You never realize just how long all of this takes until you start pouring weeks, days and hours in to it! I thought I'd give you a closer look at all of the projects and share links to videos and/or blog posts in case you'd like more details. 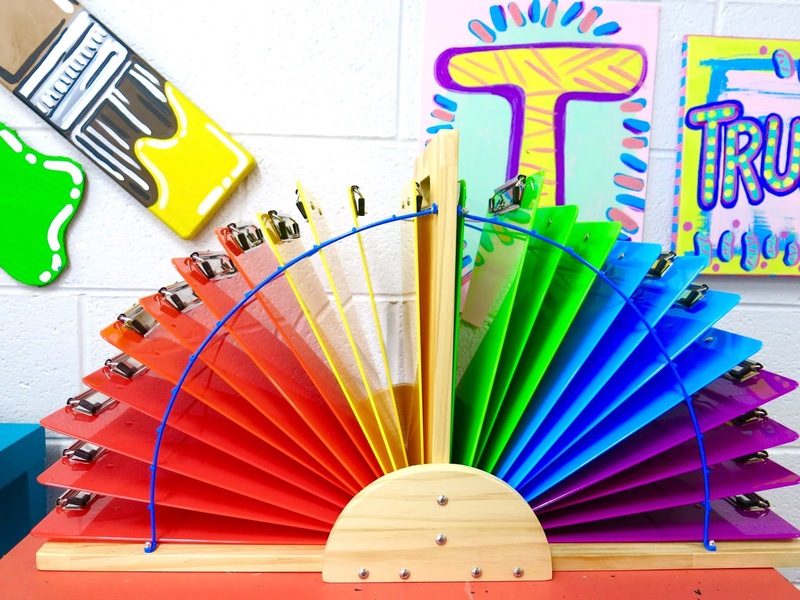 We'll start with this fun and easy kindergarten project! 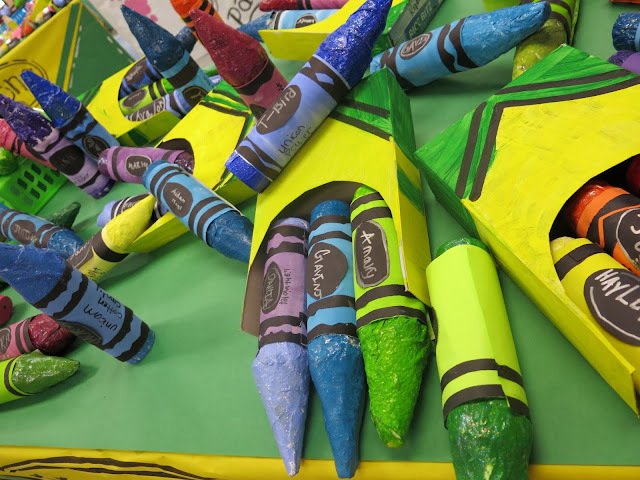 All of our clay projects were created with Amaco's low fire cone 06 clay. 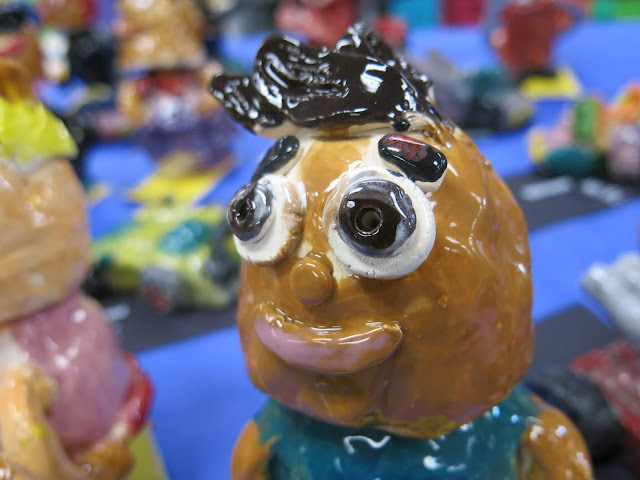 We also used Amaco's Teacher's Palette Glaze, which we loved. The colors are so vibrant and shiny. 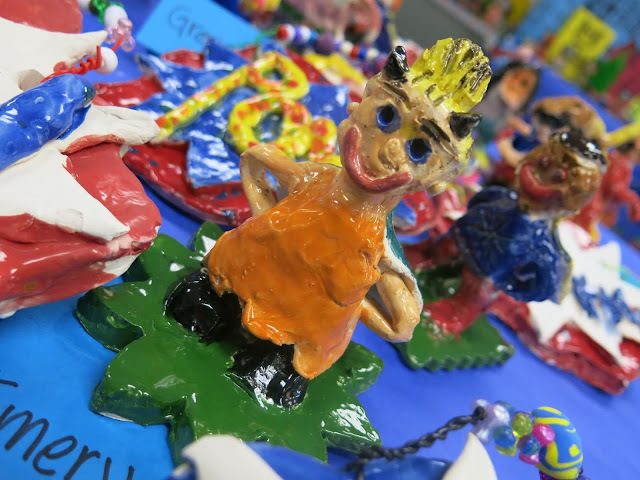 The art class following our clay project, we worked with the three primary colors of Crayola's Model Magic Clay. The kids had to create the secondary colors and make them into a bead of rainbows by adding them to skewer sticks. 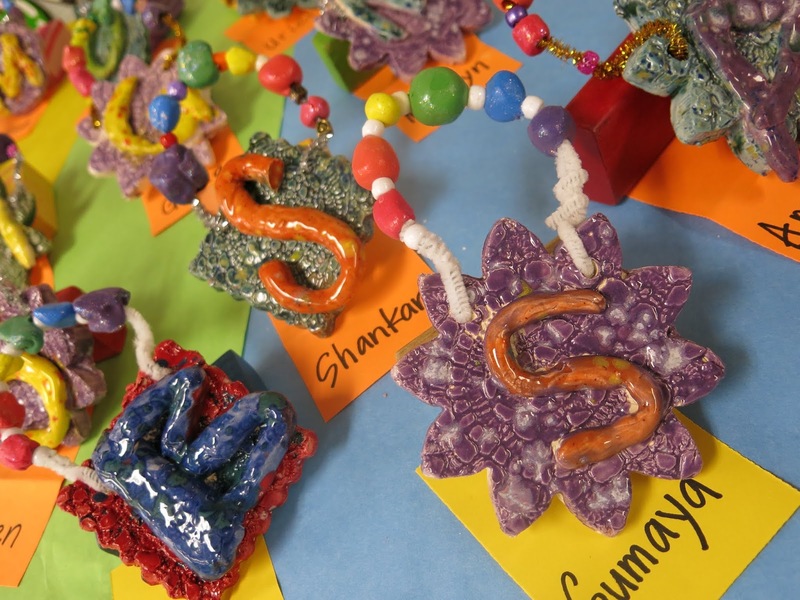 From there, we used pipe cleaners to add them to our plaques with a little pony bead in between! 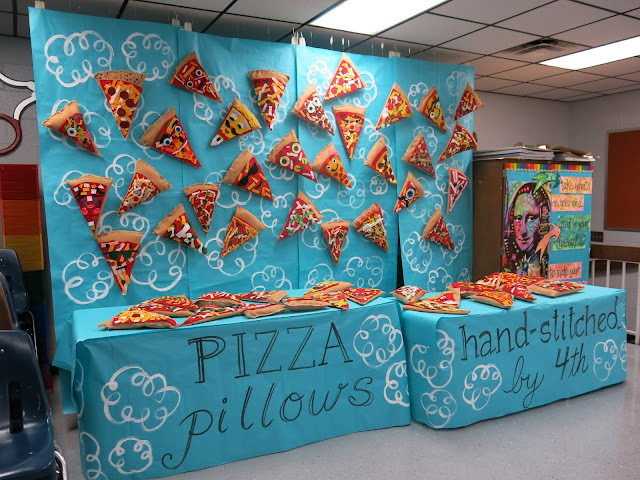 The art show 3D displays were set up in four parts: kindergarten plaques, the superhero displays, the pizza pillows and, my favorite, the Art Supply Store! 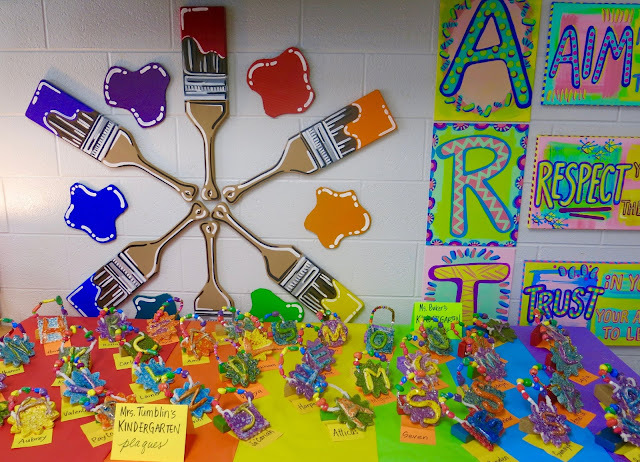 After learning about the artist Lucy Sparrow, I had each of my first through 4th grade classes create an art supply. My third graders and some of my second graders created these crayons. Complete lesson and video here! One fourth grade class created these glue bottles and also made little pencils. This project was so easy, it was kinda crazy! Here's the lesson with video. Not only did we create these glue bottle sculptures but we also had to come up with a name for them! These were a hit at the show. 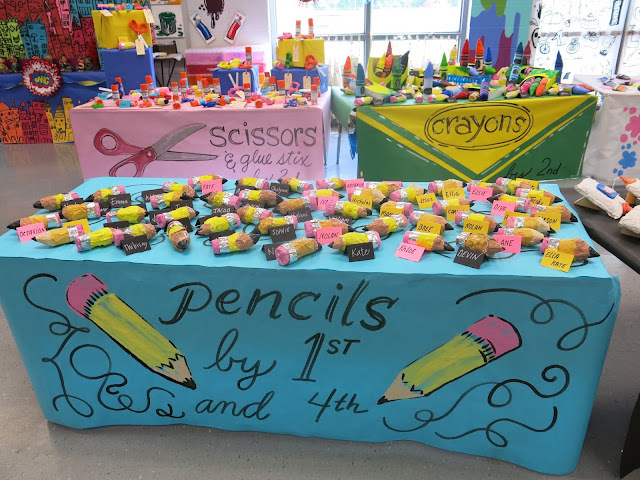 First grade and the class of fourth who made the glue bottles created these cute little pencils! This is an easy and quick project that you can find more details on here. 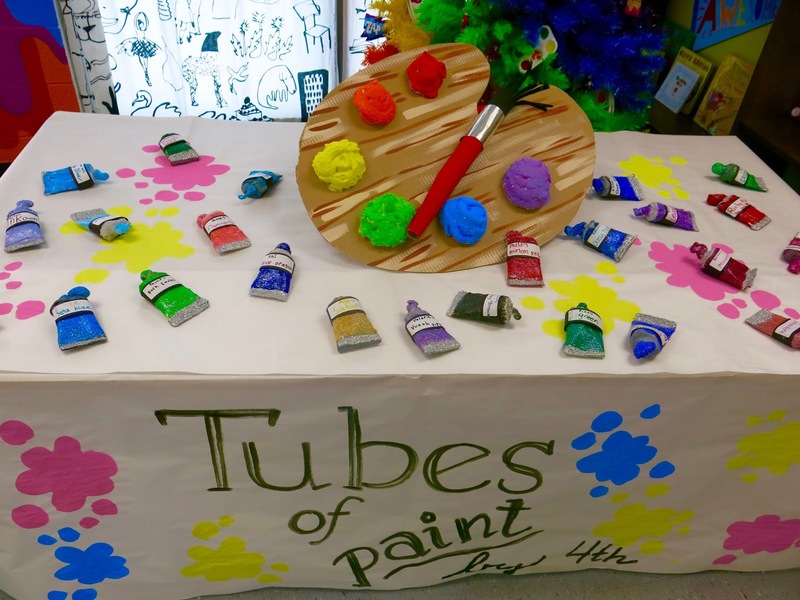 A couple of my other fourth grade classes created these tubes of paint! 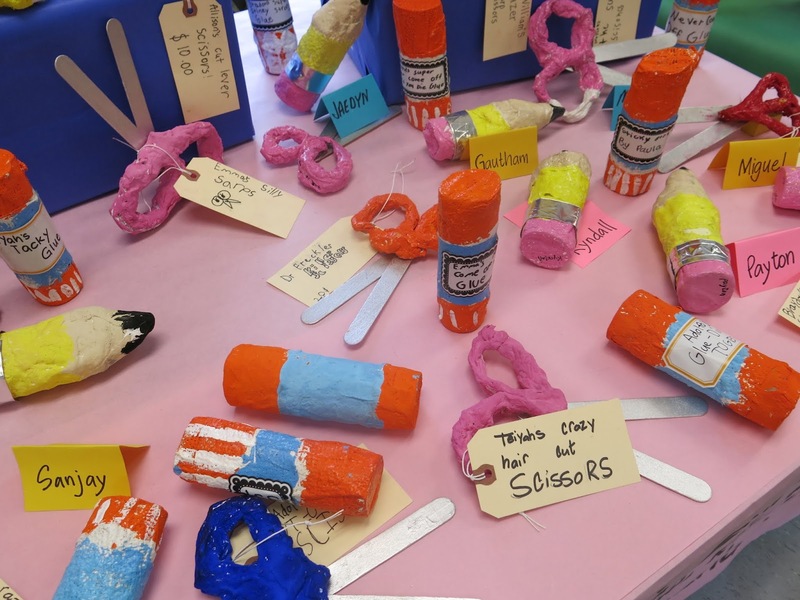 I'm telling you, creating these art supplies was not only fun but a great lesson on recycling as most of them were made with a toilet or paper towel tube base. 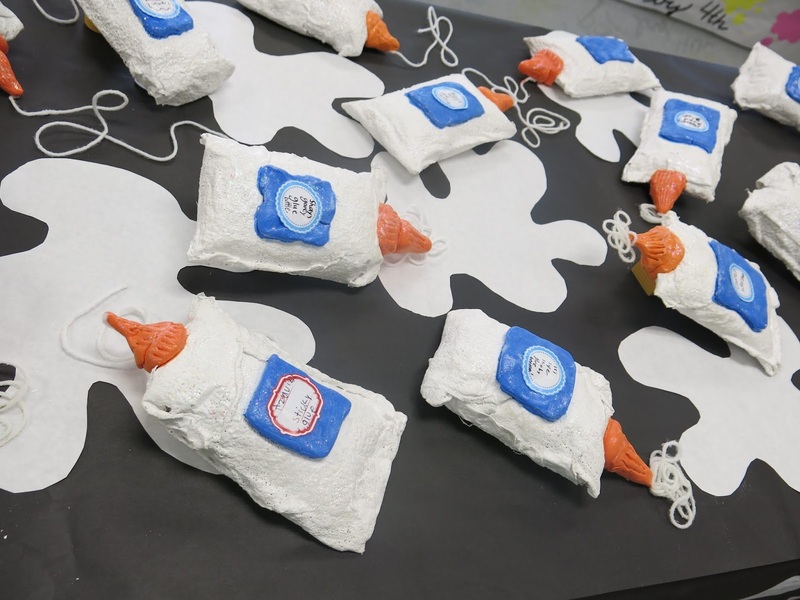 You can find out more about this project here. 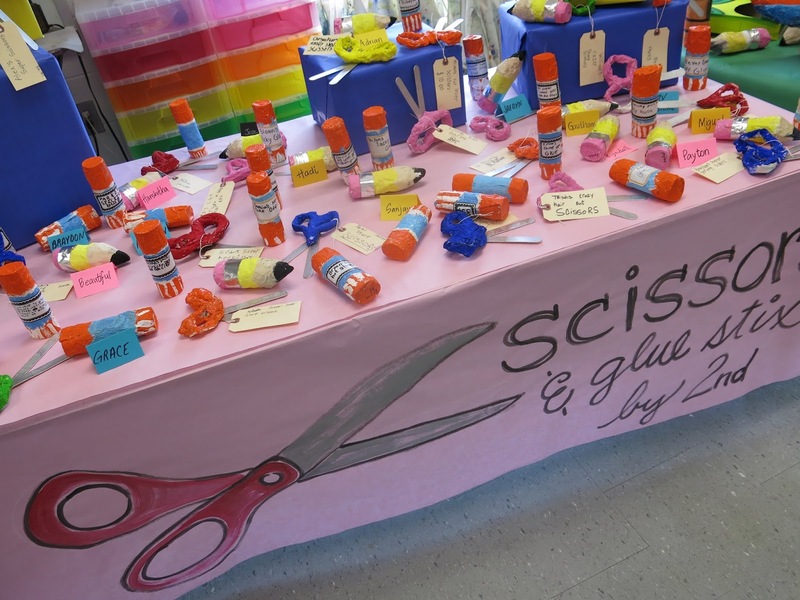 One project I never got around to blogging about were the making of these second grade scissors and glue sticks. 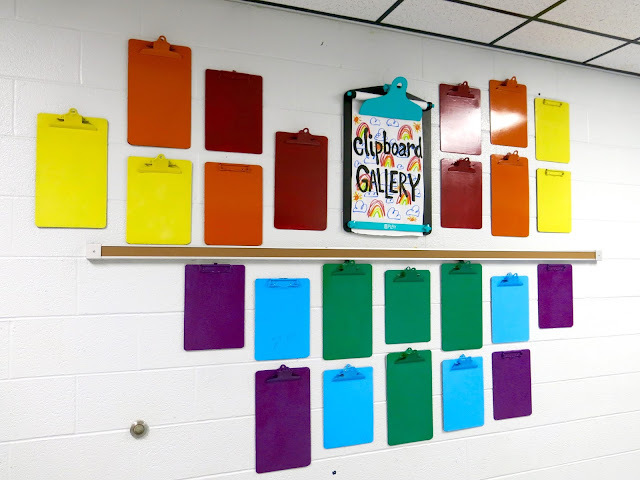 These were super fun and easy to make...my favorite part was reading what the kids decided to call their "product" and price it. 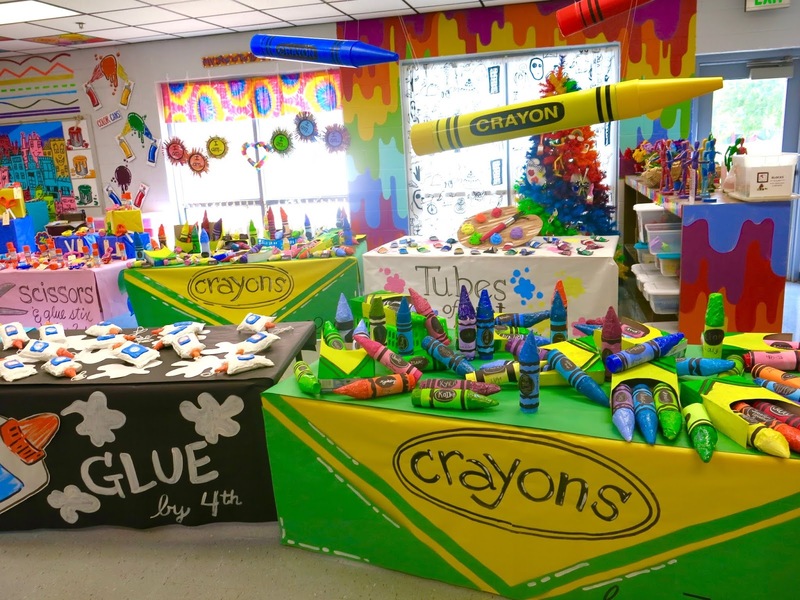 And that wraps up our art supply store! 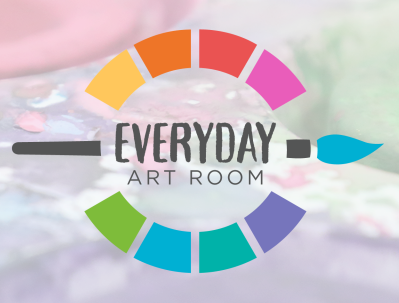 Join me tomorrow and I'll take you on tour of the rest of the 3D displays of our art show...or watch the video for the complete tour.